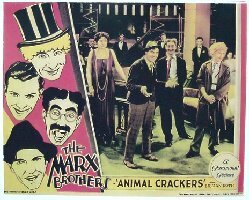 In their second movie for Paramount, the Marx Brothers once again took a successful Broadway play to the silver screen. 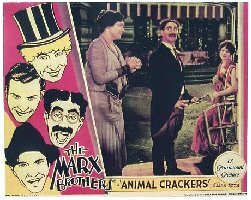 In this outing, Groucho plays the infamous Captain Jeffrey Spaulding, African explorer, the guest of honour at a Long Island party (accompanied by Zeppo as his field secretary, Horatio Jamison) being given by Mrs. Rittenhouse (Margaret Dumont). Roscoe W. Chandler (Louis Sorin) is displaying a painting, Beaugard's "After the Hunt," in honor of Captain Spaulding's visit. Of course, two of the guests at the party have made copies of this painting and, for their own reasons, want their copies displayed in place of the original. Harpo, as The Professor (of what nobody knows), and Chico, as Signor Emanuel Ravelli, roll in to add a little music and larceny, and then the fun begins. This film features one of Groucho's most memorable tunes, "Hooray for Captain Spalding." An interesting factoid about song is that lines of Groucho's lyrics were removed from later versions. 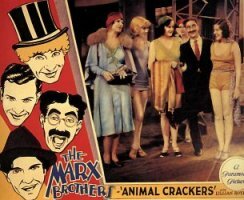 Originally, Groucho answered Mrs. Rittenhouse's line, "He's the only white man who covered every acre," with "I think I'll try to make her." The lines that were cut (there are several) were done not in 1930, when the Hays Office was pretty liberal, but after 1934, when Joe Breen started to crack down, and apparently occurred in reissue prints (or on the release negative), and these seem to be the only versions available today. (If you're interested, you can view all the lyrics to this song at Hooray for Captain Spalding.) This film also contains one of the few scenes in which Zeppo was actually allowed to be funny, as he takes the liberty of interpreting Groucho's letter to his lawyer, Hon. Charles H. Hungadunga. SPAULDING: As I say, we tried to remove the tusks. But they were embedded so firmly we couldn't budge them. Of course, in Alabama, the Tuscaloosa but that is entirely ir-elephant to what I was talking about. This was the last film the Marxes would shoot at Paramount's Astoria Studios in Queens, New York. Part of this complex is now the home of The American Museum of the Moving Image, which has a wonderful permanent display of equipment and paraphernalia from movies and television, as well as various temporary exhibits and films. In 1998 Turner Classic Movies has broadcast an original documentary entitled, "Glorious Technicolor," about the development and use of Technicolor. It included a 13-second sequence from a rehearsal of Animal Crackers which was in vibrant color. It was, apparently, the scene in which Harpo arrives as "The Professor" and hands Margaret Dumont his stick horn. One of the most interesting aspects of the footage is that Harpo is wearing a bathrobe and no wig (he has brown-reddish hair). (Everyone else is in full costume.) Sabucat Productions obtained it from somebody who had found it in a barn many years ago, as part of a series of color film clips that were pieced together. 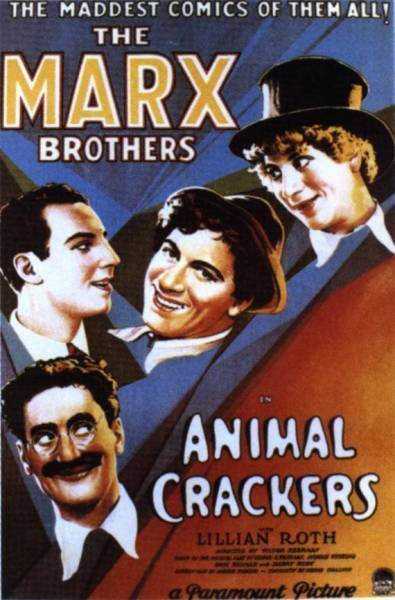 This is the ONLY Marx footage in this reel of film. The scene in the clip below happens just after the scene introducing Signor Emanuel Ravelli. This footage was shot in 1930 at Astoria Studios in (probably) 2-color Multicolor, a precursor to Cinecolor. This clip is all of the footage that Sabucat have. It is obviously some sort of rehearsal. There is no sound. Sabucat don't know any details as to why and how this footage was shot. In fact, they are hoping maybe YOU have some information to tell them. Italian title Matti da legare! 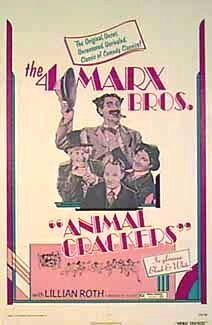 Music and lyrics by: Bert Kalmar, Harry Ruby Groucho, Cast This became Groucho's signature tune and was, for example, used in "You Bet Your Life"